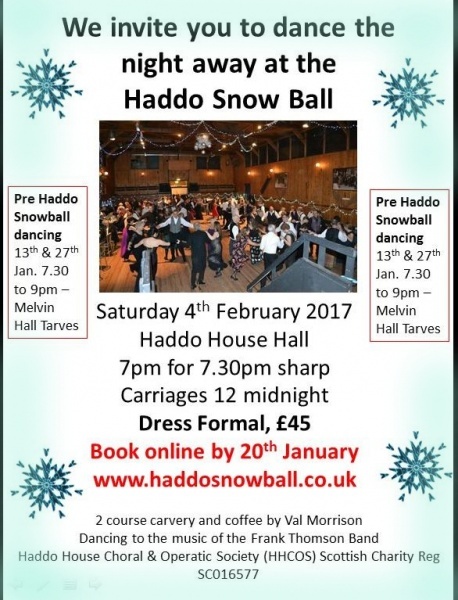 The Ball will be held on the 4th of February 2017, from seven until midnight, in the Canadian Hall at Haddo House. Dress formal. Dancing will be to the music of Frank Thomson and his Band. There will be the usual high quality buffet, served at 7.30 prompt. We are trialling online booking for the first time. The details of how to book are below, the preferred payment method is PayPal. You do not need a PayPal account to use the service, any Visa or Mastercard will do. There will be the option for a BACS transfer if required, cheques are also acceptable. If you have any questions whatsoever, or want to pay by BACS or cheque, please use the email link below. Ticket sales will close on the 20th of January. The main beneficiary of any profits will be the Haddo House Choral and Operatic Society (HHCOS).